Have you been searching for motivation to improve your fitness? Look no further than group fitness classes at American Family Fitness! Delve into a healthier lifestyle with the camaraderie of friends. Are you on the lookout for new and fun ways to improve your fitness? Why not try group classes at American Family Fitness? Led by an instructor and surrounded by mood-boosting music, you'll join others who will hold you accountable, encourage you, and motivate you to success. Our gym in Chester offers both low- and high- intensity exercise classes, so there is a way to workout for every member. From yoga and Pilates to mixed martial arts and Zumba -- there's a class for everyone, right here at our Chester gym. Do you enjoy the energy and motivation of a group atmosphere? With group fitness classes at the best gym in Chester you can have that! With knowledgeable instructors, motivating music, engaging exercises, and a motivating group atmosphere, you won’t know how you ever exercised any other way. Come sign up! We know that you lead a hectic life, and we offer our group classes multiple times a day, several days a week. Our group fitness classes include full-body workouts, step training, core strengthening, mixed martial arts, high reps with weights, and dance. 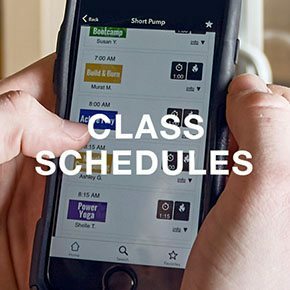 Visit our Group Fitness Class Schedule page to find a time that works best for you. Our Active class is great for anyone who is looking for a full-body workout. Blast is an amazing Step class that will get your heart pumping. Core is an excellent strengthening class that specifically targets your core muscle group, while Fight is a great fitness option for anyone interested in mixed martial arts. If you are one who wants to dance the fat away, come try our Groove or Zumba classes, and Power is an hour long high-rep workout with weights. Come sweat with us!